Blue Star Museum: Fort Morgan proudly offers free admission to active duty military personnel and their families between Memorial Day and Labor Day. 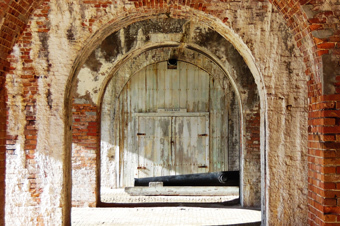 Come experience Fort Morgan, famous for its role in the Battle of Mobile Bay. It was here on August 5, 1864, Union Admiral David Farragut ordered his fleet to charge the heavily mined bay. "Damn the torpedoes!" said Farragut. Fort Morgan is available for special events and camp-outs. For more information please contact the fort at 251-540-7127 or giftshop@fort-morgan.org. Fort Morgan is at the western end of Hwy 180, 22 miles west of Hwy 59 in Gulf Shores. You can reach the site from Dauphin Island by riding the Mobile Bay Ferry.